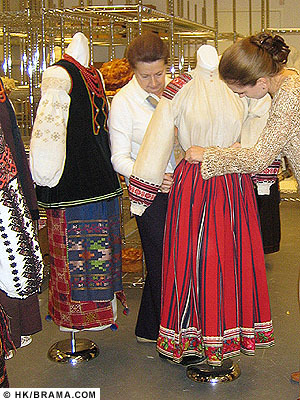 Sneak preview: Oksana Olech assists Chrystyna Pevny (left) as they fit a mannequin with a traditional Ukrainian costume. The Ukrainian Museum opens a new exhibition next week titled "The Tree of Life, The Sun, The Goddess", featuring an extensive selection from its Folkart collection. The exhibition opens to the public on Wednesday, November 23, 2005. Any visitor touring New York's Ukrainian Museum during the recent Alexander Archipenko sculpture exhibition [see slideshow] that may have asked "Where's the Ukrainian part?," will get an eyeful of colorful traditional folkart on a return trip after this coming weekend. The new exhibition titled "The Tree of Life, The Sun, The Goddess" opens to the public on Wednesday, November 23 (member previews take place this weekend). The exhibit boasts 116 groups of traditional arts and crafts in Ukrainian culture. Eye candy for visitors will include spectacularly colorful folk costumes, delectable-looking decorated breads, pysanky (exquisite Ukrainian decorated eggs), rushnyky (embroidered ceremonial cloths), kilims, woodwork, ceramics, and much more. Lubow Wolynetz, curator for this exhibition, has been preparing for more than one year, setting the context, making selections, writing the catalog, and finally, putting the exhibition pieces together. The layout was designed by Natalie Fizer and Glenn Forley of Fizer Forley Studio.